Who knew that the original home party strategy would turn into one of the largest industries in the World!? And Tupperware has been keeping up with the industry, continuing to offer the best, most innovative products for your food prep and storage! Tupperware is one of the most trusted names in housewares. We offer the highest quality products, with the finest design features to meet your special needs. Whether it’s getting a good, hot meal on the table at the end of a busy day, toting a nutritious lunch to work, or taking time to learn a new baking secret with your children — Tupperware makes it all possible. I went to a Tupperware Party years ago and was amazed at all of the gadgets they have for the kitchen. For Christmas in July I perused Independent Tupperware Consultant Heidi Cole’s website… and ended up with a list of about a dozen NEW things I want to order. I was shocked at all of the new tools they have to make meals quick and easy! The first one on my “must have” list – the Tupperware Breakfast Buddies Set. I have a really hard time with making myself breakfast – I always prepare something for the girls, but seldom take time to make something for myself. With this I can easily pop a “veggie omelette” into the microwave! 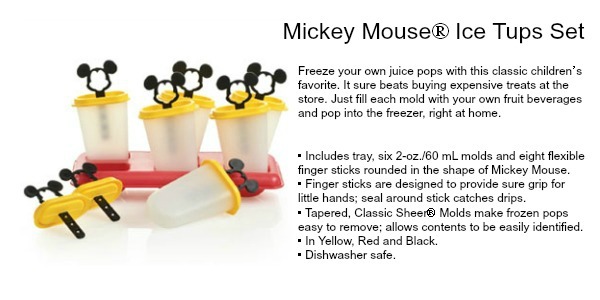 And anything Disney is a huge win at this house, so the Mickey Mouse® Ice Tups Set would be great. Especially with us going to Disney this Fall and we go through a LOT of popscicles trying to stay cool here in Florida. Plus I like knowing what goes into my kiddos popsicles – meaning I can keep the artificial sugars, colors, and flavorings OUT! Plus it can save money – talk about a win-win! Whether you are looking for a super way to save leftovers or a cute and functional way to tote your lunch to school or work, Tupperware has a product for you. And with a compensation plan that is unmatched, you can make a profit just sharing products you will use and love. Sounds pretty perfect to me. You can check out everything Tupperware has to offer on Heidi’s website!